Come with me on a trip to the Netherworld, Hades to be exact, to help Valvatorez the vampire keep a promise that he made to all the lost souls under his watch. Valvatorez is the trainer of the prinnies; the souls of sinners who are beyond redemption and have no chance of reincarnation. While holding a training class one day, a dark force interrupts his lessons and kidnaps many of his students. With that, it is clear to Valvatorez that in order for him to keep his promise, he must rescue the prinnies and destroy this new menace. NIS America brings to its fans the game that started it all and is the one that many agree is the best in the series. Disgaea 4: A Promise Revisited is the revamped PS VITA version of Disgaea 4: A Promise Unforgotten which originally released on the PlayStation 3 in 2011. 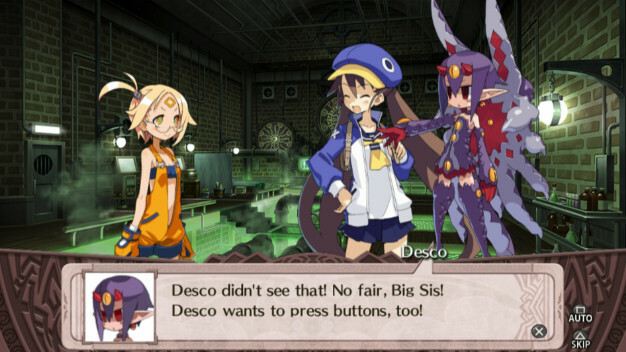 In addition to containing over 50 pieces of DLC content as well as all new characters, new spells and new scenarios, this new release features the popular game systems from Disgaea 3: Absence of Detention and Disgaea D2: A Brighter Darkness. So strap yourself in and get ready to battle your way through waves of demons and help Valvatorez keep his promise. It’s going to be a Netherworld Revolution! Detailed stats are available for each character. 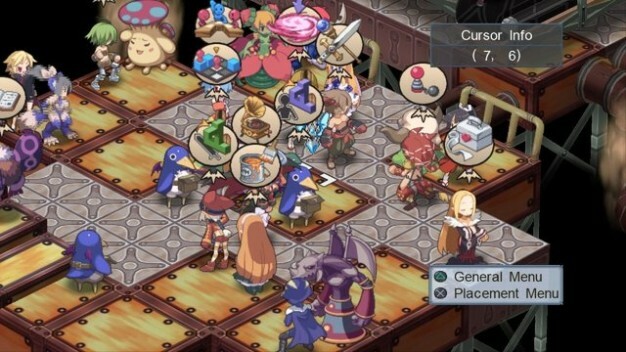 Disgaea 4: A Promise Revisited is a strategy role-playing game that combines the humorous characters and situations that the Disgaea series is known for with in-depth and engaging strategic gameplay. Battles take place in elaborate locations such as dungeons, demon laboratories and a myriad of other strange and wonderful locations in the Netherworld. The battle system is very detailed and allows you to use each character that you control to their strengths in order to dispatch of your enemies and level up your characters. Many attacks can involve up to four characters at once and makes for some really interesting ways to approach a particular foe. In addition, there is a very robust item system that allows you to purchase everything from weapons and armor to health and mana items that can be leveled up in order to help you best the monsters that you will face while on your quest. This is a strategy game through and through and provides a solid gaming experience for Sony’s versatile hand-held. The visuals on the VITA are one of its standout features and Disgaea 4: A Promise Revisited makes use of that feature in a very fantastic way. The game sports a very cartoon-y look with most elements being hand drawn. It looks a lot like anime and this really is where the charm of this game lays. The backgrounds and characters are all done in bright, fun colors which helps to complement the slapstick comedy that the story is built on. Being that this is an SRPG, there is a lot of dialogue and the subtitles are accompanied by the image of the person that is speaking at the time. These images are also hand drawn in an animation style that helps to bring the characters to life and gives a better presentation than just slapping a bunch of text on the screen. Overall, the visuals in this game are very pleasing to the eye and kept me engaged in the story and invested in the journey to save those prinnies. The soundtrack in Disgaea 4: A Promise Revisited has been upgraded to compliment this new release and contains some really good music that fans have come to love. Most of the tunes in the game are upbeat and sets the mood for the entire game. Sound effects are of a high quality and are a real treat to hear when you are dispatching a baddie. Swords cut through the air as they come to bear on a foe with a satisfying clang. The crash of a fist to Valvatorez’ face from an opponent is also sufficiently pleasing. The voice acting is also another highlight to this new release. Although some of the lines that they deliver are often very ridiculous, they do a great job of bringing the characters to life. I don’t think that I have laughed so much from a video game and the comedy aspect of this game is a refreshing departure from all of the serious games on the market today. 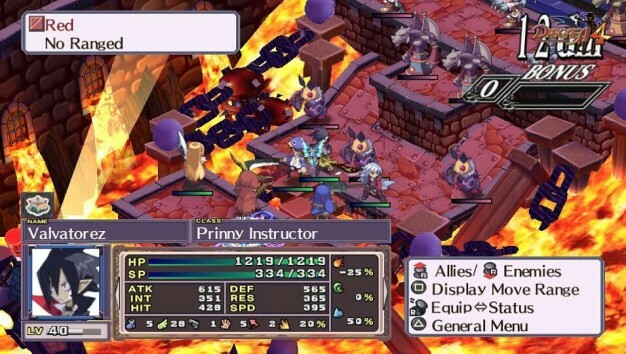 Disgaea 4: A Promise Revisited does a great job at what it does and strategy game aficionados would do well to pick this title up if they didn’t grab it on the PS3. The only thing that gave me pause was the amount of enemies that are on the screen at once in the battle areas. There could be up to five enemies on screen as well as up to seven or more allies that Valvatorez can call on in any particular battle. On the VITAs small screen, it often got hard to tell where my characters ended and the enemies began. The game does offer a way to swing the screen around in four different directions but I still had trouble picking out who was who in the middle of heated battles. To remedy this, I would only bring in one or two other allies just to keep the battlefield from getting too cluttered otherwise it just got to be a big mess. Battlefields can get rather cluttered at times. Those people that love strategy role-playing games will definitely love what Disgaea 4: A Promise Revisited has to offer. The battle systems can be somewhat overwhelming if you are new to the series and this learning curve may turn some players away. However, if given enough time, the ways in which you can use the systems to be victorious in battles gets to be second nature and the genius of how it all works together becomes clear. In a time when game publishers are charging a premium price for game content, NIS America is offering a lot of gaming content for the money with this release.